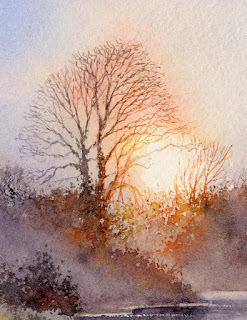 Capturing sunlight effects in watercolour can be a magical, though sometimes a little less than magical experience, depending on the result. One effect that many artists ignore is that of the sunlight burning out the detail of branches when you look directly into a low sun, yet it can enhance a landscape immeasurably. Usually we observe it only when it intrudes on our scene as backlighting towards sunset, but it is easy enough to go out on a sunny evening and seek out a suitable example. Looking directly into the sun can be dangerous to your eyes, so wear dark glasses and don’t look right into the sun. If you use a camera be sure you don’t look at the sun through the lens. Staring into bright light for any length of time can be extremely uncomfortable and cause spots before the eyes, so if you are keen on capturing this effect then keep your gaze away from the brightest part of the sunlight, making sure you are fully protected with sunglasses. This scene is detail from one of the paintings in my forthcoming book Skies, Light & Atmosphere, and you can see how the strong direct sunlight has bleached out the ends and parts of branches, while at the same time turning them to red and gold. It also has the effect of weakening the strength of tone in the affected parts. Most of this effect was achieved with a fine sable brush – a number 2 or 3. Try out the effect of changing colour and strength of tone on scrap paper, and with a little practice you’ll find it won’t be too difficult a technique to master. Ease the pressure off the brush as you describe the branch, moving outwards from the trunk. This entry was posted in David Bellamy, Direct sunlight effects watercolor by David Bellamy. Bookmark the permalink. Stunning! I do hope some of my mountain walking friends follow the shares I do of your blog; there is a lot of common appreciation! Gorgeous painting. I am a very beginner watercolor painter. I was a photographer first. I didn’t get what was said about painting en plein air vs painting from photos. However the more I look and see and then try to photograph it, I see what the photo shows that is not accurate, such as over-exposure in one area and under-exposure in another. The human eye takes it in differently and I think it is the same thing with the setting sun burn-out. This must be why sometimes I see paintings and what comes to mind is “this looks fake but I don’t know why” maybe it was too much balance with a thing such as the tree branches. My mind knows it’s wrong sometimes or flawed but I couldn’t pinpoint why.